to celebrate the sesquicentennial year of Dickinson's introduction of the blueberry to the state, Maine's number one culinary delight. In the coming days, we will post pictures, poems, and particulars about our trip to Mt. Desert Island and Acadia National Park. After visiting Mt. Desert Island in 1868 -- and after sampling his first steamed lobster -- Emmett Lee Dickinson wrote his short poem "A Lobster is a joy of Earth" (below left). Dickinson's poem inspired third cousin Emily to pen her lines "A Letter is a joy of Earth" (below right). Maine became a state in 1820. However, the population of early Maniacs struggled for many years as there was no major industry or cash crop for the state. Many tried to establish Maine as the fiddlehead fern capital of the world, but other planters fought to make Maine known for red meat "watermelon" radishes, pineberries, and/or kohlrabi (a form of wild cabbage). Pictured at the right: Fiddlehead Ferns, thought to be a culinary delight in Maine. Then in 1868, Emmett Lee Dickinson (Emily Dickinson's third cousin, twice removed -- at her request) traveled to Mt. Desert Island with his friend Nathaniel Hawthorne, and he saw the potential in Maine for the wild blueberry. He planted some during a prolonged visit there, and he was surprised how quickly the bushes took to the climate. It wasn't long before the blueberry became the primary culinary delight from the state -- followed by Cajun Nachos, lobster, corn chowder, and Whoopie Pies. Emmett Lee Dickinson's poem "I taste a muffin ever blued" (below on the left) inspired Maine farmers to try their hand growing blueberries. By 1862, blueberries were the cash crop for the state, and the sale of blueberry products became the state's top industry. Dickinson's poem also inspired third cousin Emily to pen her poem "I tasted a liquor never brewed" (below on the right). Yield such a cake that’s fine! From bushes decked in blue. I shall but eat the more! ​In addition to the wide variety of blueberry treats, we also dined on lobster, lobster, lobster! 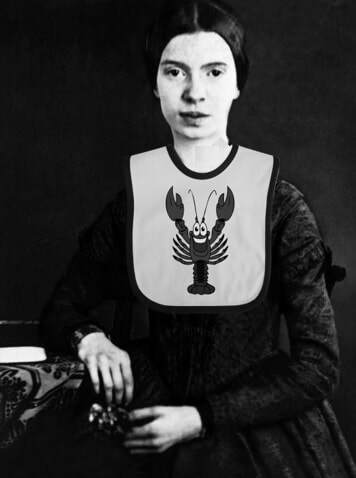 Of course, Emmett Lee Dickinson did not invent the steamed lobster -- or drawn butter for that matter -- but he did invent the lobster bib. Below: Our two favorite spots for lobster on Mt. Desert Island: Thurston's Lobster Pound in Bernard, ME (left) and Beal's Lobster Pier in Southwest Harbor (right). The Jordan family of Seal Harbor, for whom Mt. Desert’s Jordan Pond is named, built a farmhouse near the pond, and in the 1870s they added a restaurant known as the Jordan Pond House. Best known for its service of tea and popovers, the restaurant became a regular location for high society. How did the tradition of popovers start? Emmett Lee Dickinson visited the area in 1874 and said to Josefa Jordan, “I’m going to pop over to your restaurant for a quick bite to eat,” and Ms. Jordan had a flash of inspiration. Below left & right: Jordan Pond, Jordan Pond House, and pop overs. We were served the original traditional vegetable of Maine, fiddlehead ferns, at Cafe 2 in Southwest Harbor. Meh. They weren't bad, but perhaps a side dish of pasta would have been better with the chicken piccata. Now, on the other hand, we LOVED the homemade potato chips covered with melted gorgonzola cheese, tomatoes and scallions, and drizzled with a balsamic vinaigrette. Pictured at the right: Fiddlehead Ferns at Cafe 2. Pictured below, right: The delicious homemade potato chips with the gorgonzola cheese. Below left: We enjoyed a DELICIOUS blueberry milkshake and some of the reddest hot dogs we've ever encountered at Jason's in Ellsworth, ME (and as you probably know, Emmett Lee Dickinson invented the hot dog...some info/poems HERE). Below center: At Little Notch Cafe & Bakery, we enjoyed delicious sandwiches, various blueberry treats, and some Maine root beer. Below right: In Holden, ME, we tried to sample some of "Pete's Pretty Good Ice Cream," but I suppose the ice cream just wan't good enough, as the joint is permanently closed. Left: Acadia National Park is on Mt. 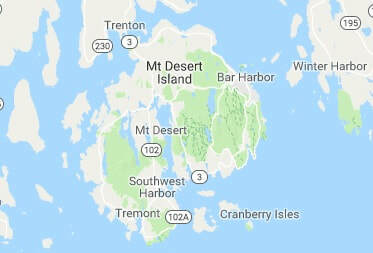 Desert Island, the largest island off the coast of Maine. French explorer Samuel de Champlain's observation that the summits of the island's mountains were free of vegetation as seen from the sea led him to call the island L'île des Monts Déserts (Island of Bare Mountains). However, locals do not pronounce the name as Mount DEZert Island (like a barren, arid landscape); instead, they pronounce it "Mount daZERT Island" (as in "deserted"). Emmett Lee Dickinson did not like the name as the island was neither a desert nor deserted. He met and stayed with a Wabanaki tribe on the island, and he witnessed first hand as they fished, hunted, and gathered berries, clams, and other shellfish in the area. He proposed that the island be called "Acadia," the Wabanaki word for "land of plenty" or simply, "good and plenty." To this day, the official candy of the park is "Good and Plenty," made from the the root of Glycyrrhiza glabra. Licorice made from extracts of Glycyrrhiza glabra was a favorite of the Wabanaki people. Bar Harbor was originally called Ahbaysuk, the Wabanaki word for "clambake place," as the shore of the area was their favorite clam gathering place (evidenced by the abundant piles of shells left in the area). However, as the town grew, more and more bars, taverns and watering-holes were established, and Emmett Lee Dickinson and his friend Nathaniel Hawthorne would frequent many of them. 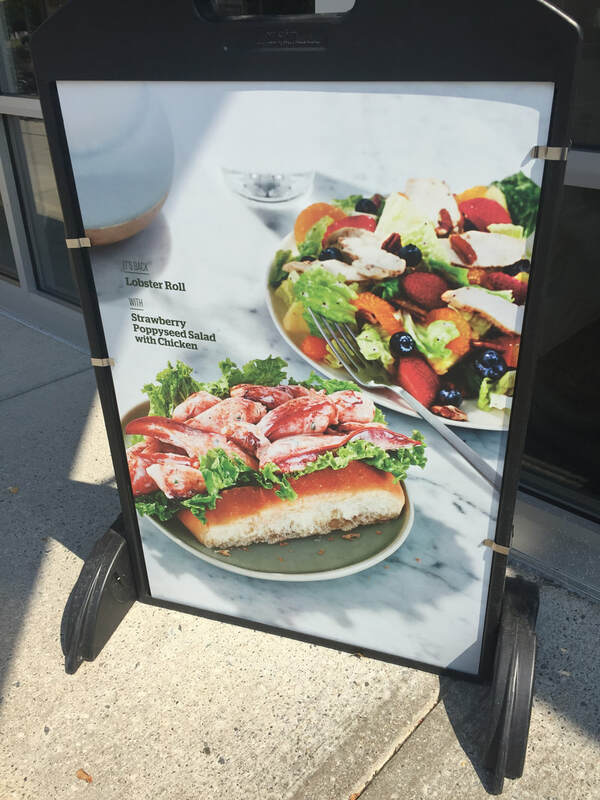 In an interview with the Bangor Daily News about the popularity of the blueberry in Maine, Dickinson spoke of his frequent trips to Ahbaysuk, and he was quoted as saying, "I'm not much for all of the clam bakes, but that place sure is my bar harbor" -- and the name stuck! From that day forward, Ahbaysuk, Maine, was known as Bar Harbor. 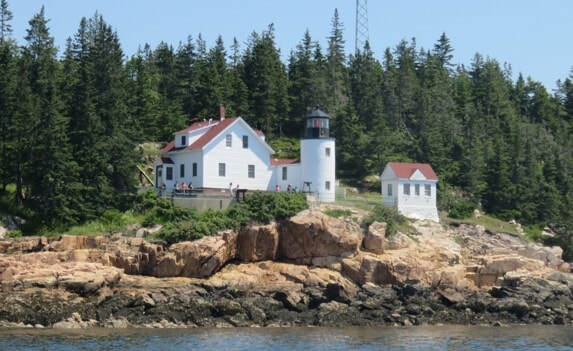 Below: While much of our time was spent on the coast of Maine and/or inside Acadia National Park, we also found two hidden gems. One is the Asticou Azalea Garden, and the other, Thuya Garden. both located in Northeast Harbor, Maine. Below left: On July 5, we took the R. L. Gott to Frenchboro, Maine (population 40), an island south of Mount Desert Island. Below right: Wildlife along the way (seals, eagles, eider ducks, and cormorants). Below left: We visited Frenchboro's Emmett Lee Dickinson School for Boys (now the Frenchboro School), the first school built in the state of Maine. Below right: Captain Eli brought in a few lobsters and told us all about the lobster industry. The Wendell Gilley Museum celebrates the life and work of Wendell Gilley, a pioneer in the field of decorative bird carving. Below center: The duck on the left wasa Gilley's first attempt at carving a duck. The duck on the right was carved 31 years later. While in Winter Harbor, Maine, we visited the Emmett Lee Dickinson School for Boys. Acadia National Park & Cadillac Mountain as seen from the Schoodic Peninsula.